Skin (unfeathered): Severe multifocal to coalescing hyperplasia with ulceration. 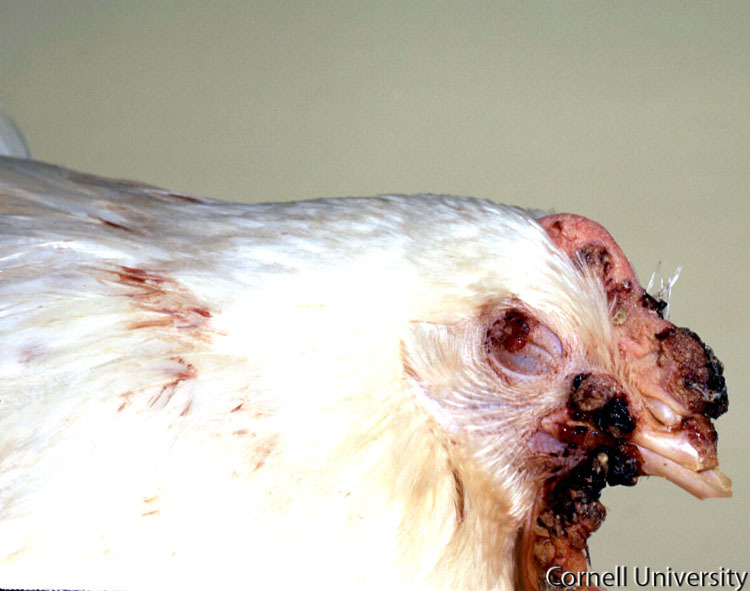 Cutaneous (dry) form of avian pox with proliferative lesions and scab formation on the comb, wattles, and eyelid. In some cases, the eyelids can become so severely affected that vision is obstructed. The unfeathered skin of the face, comb and wattles is covered by multiple, irregular dry, tan nodules that are often ulcerated and encrusted with dried serum and blood. The nodules vary in size and sometime coalesce. This is particularly evident on the comb and cranial portion of the wattle. The lesion on the eye impinges on the ability of the eye to open.